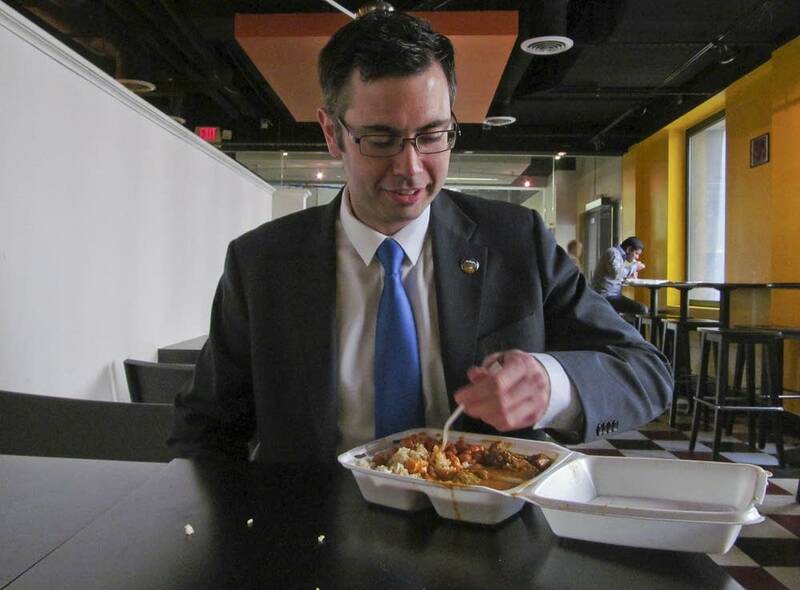 Some Republican state lawmakers are trying to make it harder for cities to pass their own minimum wage hikes or ban polystyrene take-out containers. This is the second year that preemption, which would neutralize some local regulations, has been a hot topic at the Capitol. Gov. Mark Dayton vetoed a preemption bill during the special session last spring, but the idea is making a strong comeback through a host of other bills. The House Government Operations Committee took up a measure Wednesday that would prohibit bans on polystyrene takeout containers. On Tuesday, the Senate State Government Committee advanced a ban on ranked choice voting by a 5-4 vote. Other bills would limit local regulation of ride sharing services such as Uber and Lyft, and overturn the renaming of Lake Calhoun to Bde Maka Ska. Gov. Dayton said he doesn't see the need for them. "It's one of the things where everybody talks about, well, we need preemption because we're going to have this patchwork quilt all over the state. And it isn't happening," Dayton said this week, when asked about the measures. In particular, Dayton said he isn't interested in rolling back changes that cities have already made, including ranked choice voting and sick and safe time benefits for employees. The prospect of getting trumped by lawmakers in St. Paul is also alarming local officials, who say local control is exactly the kind of politics Republicans in the majority have lauded in the past. "We end up spending a ton of time looking into these issues, and making a decision that makes sense at a local level, and here you have state legislators trying to override all that work," said Minneapolis City Council Member Andrew Johnson. But the issue remains one of the top priorities of the business community. The Minnesota Chamber of Commerce said the headaches and uncertainty of complying with regulations in multiple jurisdictions is already driving investment out of state. "Some businesses will stay right where they are and figure out how to comply with these burdensome new regulations," says Cam Winton, a spokesman for the Minnesota Chamber of Commerce. Other businesses though, have chosen not to expand in the cities where they currently are, because they have to deal with new regulations, and they expand elsewhere. Or worse for Minnesota, they just expand in other states, where they don't have to deal with this." Winton also said Minnesota's historically low unemployment is already driving wages toward that $15 dollar mark and improving benefits. Last year, business groups were in court fighting the sick time mandate in Minneapolis. A win there could have potentially taken down all these local variations in a single stroke. But that legal challenge got thrown out, as did a subsequent challenge of the city's minimum wage ordinance. That leaves only a political solution for now, and a flurry of preemption efforts could give Republicans some bargaining chips in negotiations with Dayton. Compromise has been hard to find, however, and the last session ended with an expensive court battle that will cost taxpayers an extra $700,000. But there does seem to be some daylight the second time around. Rep. Pat Garofalo, R-Farmington, has been the champion of these preemption efforts. He said Republicans don't want to repeat last year's face-off, but want to hear Dayton out on a potential compromise. "Something that has uniform labor standards across our state, but also addresses some concerns the Governor has," Garofalo said. "What those are, whether it's statewide paid leave for new moms, some sort of minimum sick leave benefit program, those are things that can be negotiated." Correction (March 30, 2018): An earlier version of this story included audio that incorrectly reported Gov. Mark Dayton seeking a 2nd term in office.